Well, I’m nearly recovered from Supanova, the geek spectacular attended by around forty thousand people at Olympic Park over the weekend. 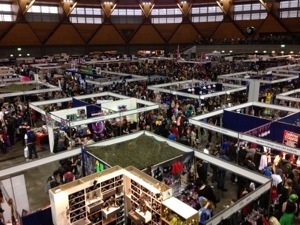 Supanova consists of three elements, famous people, cosplay and geek shopping. Oh, and some lectures and displays. Four elements. We didn’t bother with the famous people. I’m sure they were there, but to access them you had to line up to purchase an autograph or photo ticket, then line up again to meet the presumably haggard looking famous person who you’d never recognise as their movie character because they’re either not covered in prosthetics or they’re forty years older than when they were famous. I’m looking at you, Margot Kidder, who didn’t turn up the second day after looking out the window and deciding to stay in her dumpster. Ooh, that was a little harsh, wasn’t it. I wonder if they should at least put them on a platform or suspend them from the ceiling or something so at least the kiddies can see them. 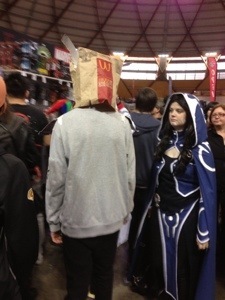 Many people are clearly there for the cosplay. Cosplay is when you dress up, usually as a movie or game character, although I think you could dress up as anything you like, really, who’s going to know? The Moose dressed in all black with a black hat and sunglasses with a long black velvet coat I picked up in a Table Eight sale some years ago. He was asked if he was Vengeance, to which he just smiled mysteriously. The more impressively costumed get queues of people wanting photos with them. There were many Batmen, the kids spotted a Fatman and a fat Flash, but I didn’t get photos of them. Geek girls are a lot fitter than I remember, I was a little disturbed by the often gorgeous Lycra clad girls being asked to pose by older men with giant cameras and doing so very happily. The Catwomen all seemed to be in great shape, not so the Poison Ivys. Odd. Many people cheated by simply buying a onesie of any description and wearing that, I even sawa woman in a cow onesie. Would have been a lot warmer than the Supergirls. Capes and elven robes were big. Harry Potter was almost non existent except for a couple of Hermione Grangers. Not everyone tried very hard. There were also a lot of prosthetic wounds and a very impressive cyborg who kept getting the giggles when he was asked to pose with the plastic arsenal at his stall. 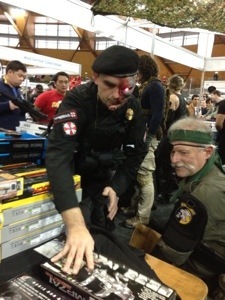 In fact there were a lot of heavily armed cosplayers, which made me wonder what the security guards at the entrance were actually going to look for. 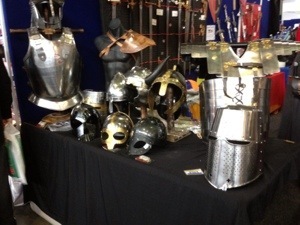 There was a stall, called Fight Club, which were selling real swords and armour. The Horror seriously considered buying himself a very reasonably priced helmet, until he discovered he could hardly lift it. He also considered a unit that looked like a shiny tough flick knife, but when you flicked it open it was actually a comb and a handy bottle opener. I think they had that the wrong way around, that’d be confiscated at the airport for sure. The geek shopping was pretty impressive, especially if you liked T shirts. Apparently no one wears long sleeved shirts, hoodies, singlets or baby doll style shirts. Just T shirts. There was a lot of plastic weaponry. I was excited to see Weta Workshop there, we got two Keys to Erebor from them. 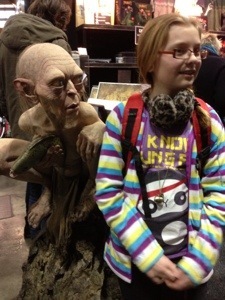 They had a very realistic Gollum with them. 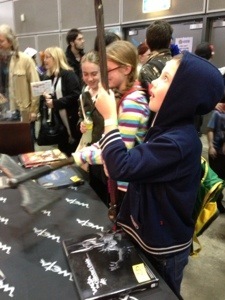 They also had some of the weapons from the Hobbit movie, which you could actually handle. Steam punk is still a thing. All of my kids bought fob watches, independent of each other. The Horror also bought a little dooverlackie that looked like a tiny brass flask, but unfolded into a working telescope. Many of the crowd bought and immediately wore Tardis beanies, we now have one in our collection, so that’s one less rainbow one for me to crochet. 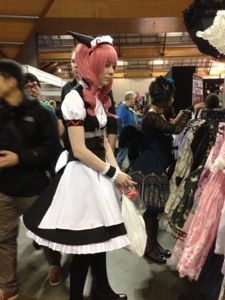 The clothing for women was a bit limited, unless you like whatever that cutesie Japanese style is called. 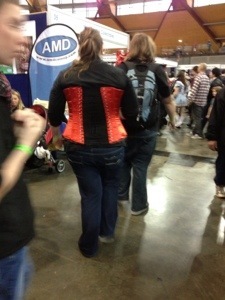 Or corsets. There were plenty of them, but not many under a size twenty. I did vaguely think about getting one when I finally found a small size, but the kids said “ew, gross, Mum, why would you want one of those?”, and there wasn’t anywhere even slightly discreet to try one on. 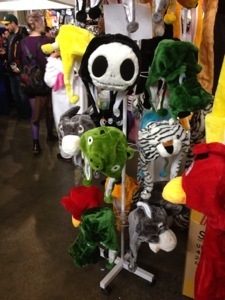 You could have got a hat with ears or gloves in whatever animal or character you could think of. 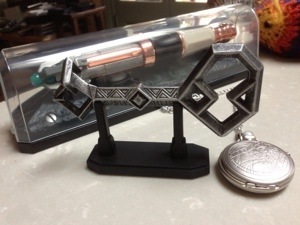 It is a very impressive sonic screwdriver. His fob watch is a beautiful copy of the Master’s watch, it works and lights up too. My only gripes were that it was very crowded, and too many T shirts. I overheard a woman saying to her friend “and this is where you get the flu”, which made me breathe in a shallow manner for a few minutes. You’d think with the type of crowd this event attracts they’d have chill out areas. I found it a bit overwhelming. But that doesn’t mean I won’t be saving up for next year.